how do you keep track of thousands of soldiers? An army casualty form was a piece of paper with your whole service history written on it. Everything Edward Herman Weber did was written on a single card with his name and service number. From leaving the country on a ship to being admitted to hospital (twice), right up until the day he got on the ship to come back to New Zealand. It was all written down on one piece of card, in neat handwriting. There was a casualty form for every single soldier in the New Zealand Expeditionary Forces. It was incredibly helpful to keep a record of thousands of soldiers serving overseas, and it helps us to see the history of these people’s lives. But it didn’t tell the story behind the trips to the hospital. 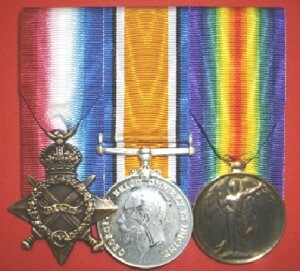 When Herman was shot in Messines, he strapped his bugle to his leg he dragged himself for four hours in the dark to the nearest dressing station. And while all soldiers had a casualty record, Herman had another place to record where he’d been - his bugle. He inscribed his brass bugle with all the names of the places he’d been, a casualty record he could carry around with him. You have been given Edward's casualty record that itemises each time he was sick or injured during The Great War. You are now tasked with discovering more of the story behind Edward Weber. How much of his story can you piece together? The suggestions below will help you on your research journey. The How We Find It Fact Sheet will also be a helpful tool in helping you discover the pieces of Edward's puzzle. You're in luck, Edward served in the New Zealand Army and so his records will be able to be found online at the Auckland War Memorial Museum Cenotaph. This is your most important search. Collect as much information as you can. Once you've found Edward's Serial Number move to Archway and search for his service documents there. Where did he go? what did he see? Casualty Records were an important way of keeping track of the movements of soldiers. Imagine being in charge of the whereabouts of 120,000 people without any internet or computers? 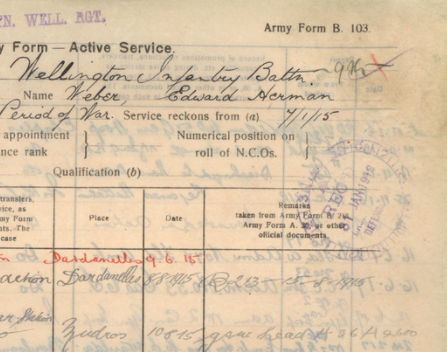 Edward's Casualty Record shows us the movements of a man who entered the war in June 1915 and did not return home until after the war had ended. He inscribed every location he served on his bugle. Can you use Google maps to map his journey between 1915 and 1918? There were many Webers in the Hawkes Bay area. Lots of Edward's documents give us clues about Edward's family. Archway gives us his parents' names; Papers Past and Google give us school awards and memorial notices. Births, Deaths and Marriages means we can see brothers and sisters born to the same parent. Can you create a family tree of the people in Edward's family? How many of them can you connect? Use Papers Past to find evidence of this family in the Hawkes Bay area. Search for the term 'Weber' and narrow your search by choosing to search only Hawkes Bay newspapers. What is the earliest evidence of the Weber family living in New Zealand (we found 1863 can you confirm anything earlier?). There is a town called Weber in the central Hawkes Bay. Can you find out how it got its name? what role does the bugle play at napier boys high school in 2018? Edward's family gifted the bugle to Napier Boys High School some years ago along with a copy of his diary of his time in the First World War. The story goes that this bugle was used to play the Last Post on the First Anzac Day observances in London. We have no way of knowing if this is true but it is a lovely thought that the bugle still holds such a special place in the hearts of boys involved with Anzac services at the school. The Weber Bugle is a treasured item at Napier Boys' High School. Can you find information about how the role the Weber Bugle plays in the school Anzac Commemorative activities? WHY DID AN ARMY NEED A BUGLER? The sound of a lone bugler playing the Last Post has become one of the most distinctive sounds in the world. As a Bugler, Edward was responsible for rousing the troops with reveille, last post, food calls and so on. In battle, he would also be required to convey command signals via the bugle, meaning buglers were often the target of snipes as this would cut off lines of communication. But World War One was much louder than any other war before it and as the war continued the function of the Bugler would cease as calls could not be heard over the noise of battle. Narrow the search by date to the 1910s. Use DigitalNZ to search for 'bugle' and 'bugler'. Find photos of soldiers like William dressed in full bugling attire as well as images of bugles during the war. Find sound recordings of a bugler playing the Last Post. where is the Napier Boys' High School first world war Roll of Honour? If you visit Napier Boys High School's Roll of Honour in their War Memorial Library the list of names of Old Boys who served and were killed is sobering. The War Memorial Library was opened after World War 2 and includes the names of both First and Second World War Old Boys who served. Underneath the Roll of Honour is a small framed black and white photograph of a First World War Roll of Honour belonging to Napier Boys High School. There are many rumours about what happened to this Roll of Honour, some say that the Roll of Honour is still on school grounds and hidden in plain sight. The shape is very distinctive and Old Boys can remember seeing it in the 1950s so it is evident that even though much of Napier Boys High School was destroyed in the 1931 Napier earthquake, the boards must have survived. Can you find where they are today? Edward's Casualty Record is connected with the story of Edward Herman Weber who attended Napier Boys' High School. The original document is held by Archives New Zealand - Te Rua Mahara o te Kāwanatanga #R22017407.This story is told with the permission of Derek Weber, on behalf of the Weber Family. Edward Weber spent 14 months recovering at this England hospital. The Walking with an Anzac Team found the first clue in Edward's story when they visited Napier Boy's High School. The school march the Weber Bugle down the main street of Napier, through a school guard of honour, with each boy carrying the name of one of the NBHS students who went to WW1. Further research on the same platforms you have used today allowed us to discover Edward's Story. Research starting points for Edward's Story.